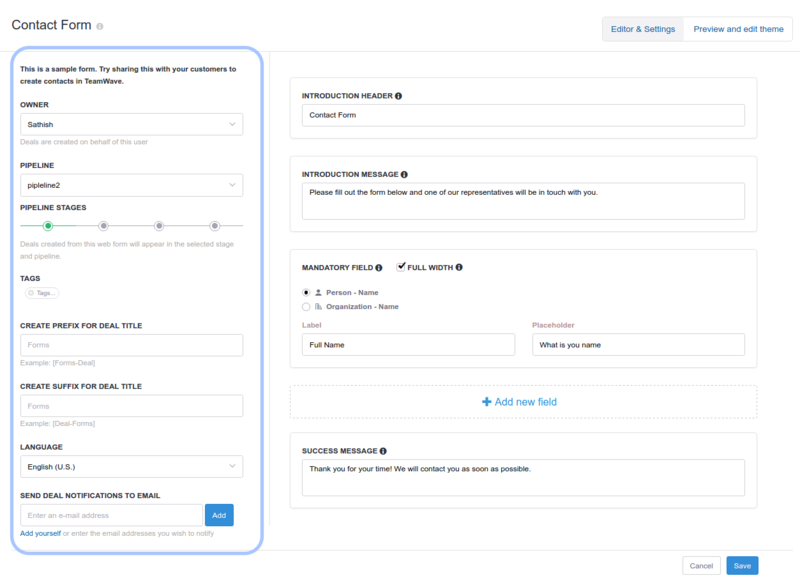 TeamWave allows you to customise Forms based on your requirements and sends all the information submitted on forms to your TeamWave account as Deals, Contacts and Organisations. You can add fields, change fonts and colours to match your requirements and branding. Learn more about TeamWav e Forms. Let's see how to create forms on TeamWave. You need to select Owner, Pipeline and Stage for the form. All the information submitted on the Form will be saved as a Deal in that selected pipeline and stage. Contact and Organisation will be saved under the ownership of the selected User/ employee. 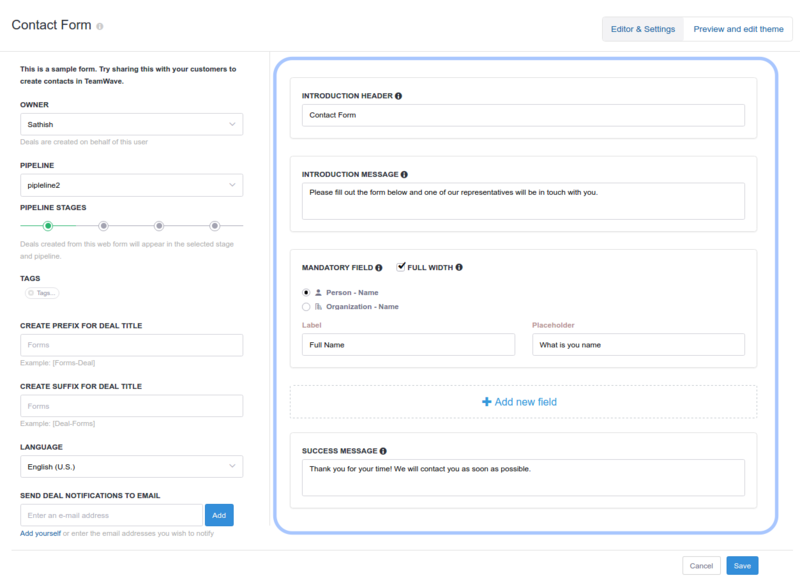 Tags: Select CRM tags which you want to be saved for the deals/contacts/organisation. All the tags selected will be saved on Deals & Contact/Organisation created from the Form. 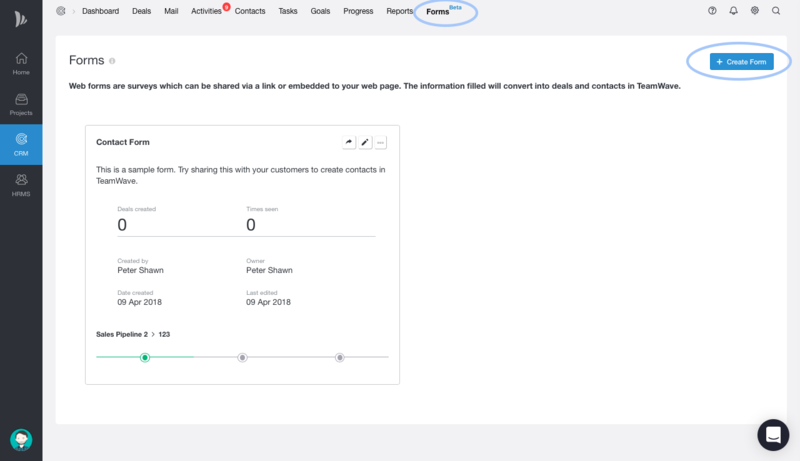 Prefix & Suffix: Any text saved to Prefix and Suffix fields in Forms will be added to the Deal name and Contact/Organisation name created from Forms. 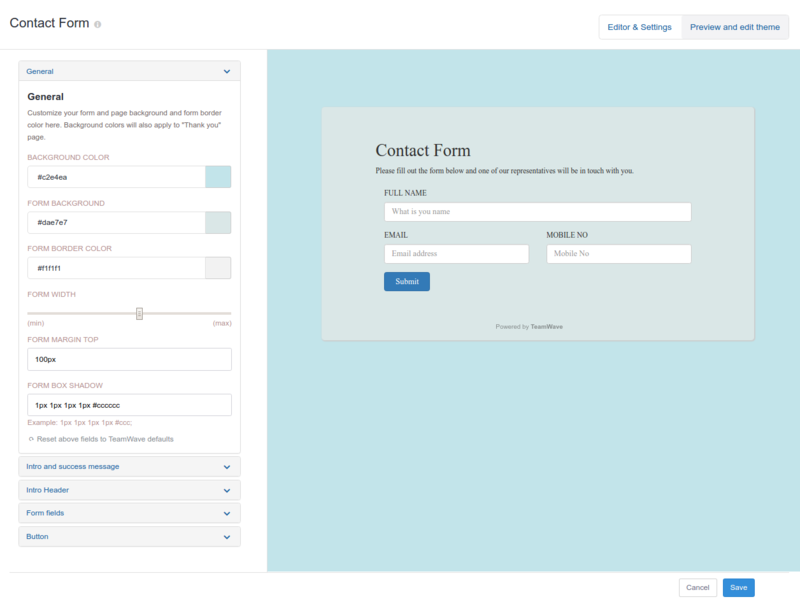 It will help you differentiate Deals and Contacts created from Forms with others. Email Notification: Add emails to this field you get notified when that is submitted. You can add any num of emails and get notified. a. Select Add New field fields button and choose from Person / Deal / Organisation / Note to add the new field. b. Then select from the custom field available. d. Select Required check box to make that field mandatory. Success Message: This will appear when a customer submits the form. You can customise every Font and Colour in the form from the options available in the left menu. Note: You need CRM Admin rights to perform this action.